In recent days, Italian newspaper Il Foglio has discussed a politicized version of the debate between “More Europe or Less Europe? More free market or more protectionism? “, quoting Salvini and Di Maio, the leaders of Northern League and Five Star Movement, respectively, as the promoters of a more protectionist view that puts national sovereignty at the centre. Il Foglio concludes that these ideas are dangerous and wrong because ‘this type of approach would lead to economic disadvantages for Italy, which should, instead, push for “More Europe and More Free Market” policies. The topic is a serious one and deserves deeper considerations, beyond the political bias. Il Foglio fails to mention who, on the Italian political scene, is instead in favour of greater openness towards the world. I would immediately think of Calenda, Italian Ministry of Economic Development, but then I remember that it was him, rightly, to push for not granting China the status of market economic (MES), so as to leave the EU the possibility of imposing higher tariffs on goods imported from China, duties that could not have been so easily imposed if the EU had recognized the State of Market Economy to China. So, the action of Calenda makes me think that he too is not really so inclined to the free market. 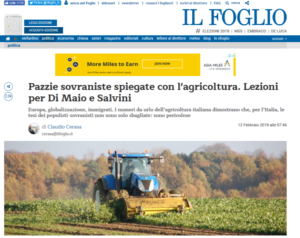 The main arguments against the ‘Salvini-Di Maio’ twins, is a series of data, such as the success of Italian exports, which today reached 450 billion euros, of which two thirds to the countries of the Union and one-tenth, 41 billion, coming from the agricultural sector. The emphasis is on the primary sector that grows, however, less than the total (6% against 7%) and therefore loses ground, but this important detail is left out from the analysis, for reasons that we will see in a moment. The rhetoric questions that Il Foglio asks are: 1) If Europe was less integrated, less open, more closed, would Italian exports today be better or worse 2) If there were more protectionism, if there were more duties, if there was no Euro, would Italian exports, which today increase thanks to the absence of barriers, be better or worse, in the presence of new barriers; 3) If immigration, rather than being simply managed, were to be stopped as the hashtag of Salvini seems to imply, would a sector like the agricultural one, which lives off the manpower offered by migrants, be stronger or weaker ?. For Il Foglio, the answers are obvious, but they are not. The fundamental mistake that the Foglio commits is to take an extremist the approach in a symmetrical way when the reality and the positions of the two promoters of greater prudence, Salvini and Di Maio, have never taken extreme positions. The questions that I ask back to the author of articles are 1) If it is true that integration leads to more exports, why should we integrate only with the other 27 EU countries? Should we, therefore, integrate with as many countries as possible, with India and China? 2) If you believe that Italian exports increase thanks to the single currency, then why not to enlarge the Euro-zone to Eastern Europe, to the Maghreb, to Asia, to India, to China and, of course, to America, our great business partner? According to this logic, export should fly over the roof 3) On migration, I would rather ask, excuse me, who is in Italy today is managing it? It seems to me, nobody. Salvini and Maio never said that migration should be stopped, rather it should be, indeed, managed. If agricultural workers are needed, migrants who are willing and capable to engage in this activity are most welcome. Nobody said he did not want migrants. Salvini has over and over said he does not want illegal immigrants, and I think Di Maio would agree. Farmers in Apulia can rest assured, no one wants to take away their labour force, indeed both League and 5S want to provide the right qualified workforce. I always quote the example of China, a country that has funded its economic success on five fundamental pillars: 1) control of duties; 2) control of exchange rates; 3) control of interest rates; 4) demographic control and 5) control of migration. Believe me, if China had a liberal approach, it would be like many other third world countries begging for funds from the World Bank and the IMF. But it is not so, China has grown 10% annually for decades thanks to these policies. It has not shut off the rest of the world, but it has controlled these variables, like the valves it has opened and closed as and when it considered appropriate, without no ideological bias. The goal of the Chinese government has always been to raise the standard of living of its citizens. In some periods, it was good to keep more control over the 5 variables, but in other periods it was better to leave it to the market, just like in production control systems regulating flows and stock. More Europe or Less Europe? I do not know but know well that I often hear Italian politicians say “Eh, we must do whit because Europe asks us to”. But, let me ask, how many times do you think that Merkel has told the Bundestag “Eh, Europe asks us to do so”? Exactly. Economic liberalism is a clear and permanent stance in nature, which tends towards openness in all sectors and to all countries. Protectionism, on the other hand, is a temporary measure, which simply tends to put a brake on the liberal drive, import duties are never perpetual, but for five years and apply not to all goods, but only to some and only to some countries, not all. Ironically, protectionism is nothing but a form of liberalism with a little delay, with a check brake. I would say that Salvini and Di Maio are “differently liberal”.